For a night like no other in a classically romantic setting, Tuscany offers traditional Italian fare lovingly prepared by Italian Chef Mauro Ferrari. Four-course set menu priced at RO 28 or RO 45 inclusive of unlimited selected wines. Welcome glass of bubbly and complimentary chocolate box giveaway. Dinner: 19:00 to 23:30 hours. To make an online reservation at Tuscany, please click here. Mokha Café brings you an exquisite Valentine’s themed buffet featuring live cooking stations on the terrace. Pianist Zara will add to a truly romantic evening as she performs a repertoire of popular love songs. Buffet priced at RO 24 including a welcome drink. Complimentary giveaway for your special someone. Special offer on Scavy & Ray Prosseco priced at RO 29 per bottle. Dinner: 19:00 to 23:00 hours. To make an online reservation at Mokha Cafe, please click here. A candlelit dinner by the sea with a classic Indonesian set menu served family style. Set menu priced at RO 35 including an unlimited flow of bubbly and a complimentary chocolate box giveaway. Please note no shisha will be available on the evening. To make an online reservation at Marjan, please click here. Indulge in a Valentine's Day inspired couples afternoon tea to the enchanting sounds of soulful melodies performed by resident Pianist Zara. High tea priced at RO 18 net per couple inclusive of a welcome bubbly. Resident pianist between 15:00 to 18:45 hours. Afternoon tea served from 15:00 to 18:00. To make an online reservation at Sirj Tea Lounge, please click here. Lots of fun planned for an anti-Valentine’s night out. Dance the most romantic night away to the sounds of resident DJ playing until 3:00am. We secretly still believes it V-Day! On offer is a special couple cocktail for RO 8 per cocktail. 40% discount on Happy Hour from 18:00 to 21:00. RO 5 regular door charge. A night under the stars and beautifully breezy weather are the perfect combination on Valentine’s Day. 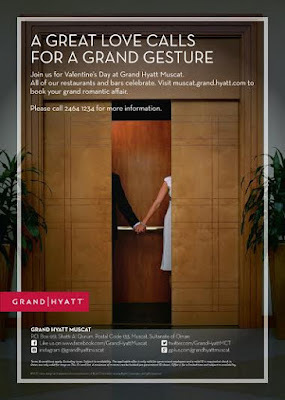 Enjoy an exquisite setting and a romantic dinner with your loved one. An all inclusive set menu for RO 30 including unlimited selected beverages, a welcome drink and a giveaway for your date. To make an online reservation at Safari Rooftop Grill House, please click here. 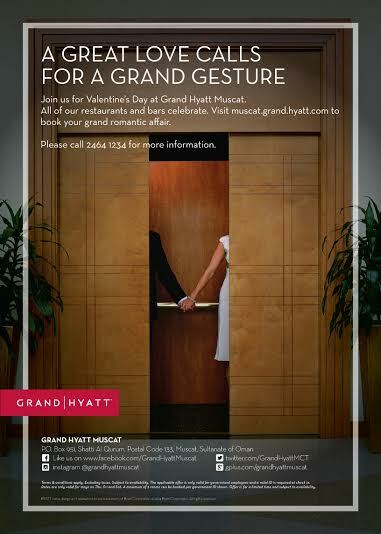 Valentine’s Day dinner reservations can be made by calling +968 2464 1234 or emailing muscat.dining@hyatt.com.